The Silver Star Camp located in Thayne, Wyoming was built in 1909 was built by the Ladies LDS Relief Society. The story of how the Relief Society got the building materials from Turnerville, Wyoming, varies, but one version suggests that the ladies of the group went themselves to pick up the supplies for construction. The ladies of LDS Relief Society never gave up on the idea of constructing this building, even though they were told that there was not enough money to support the project. 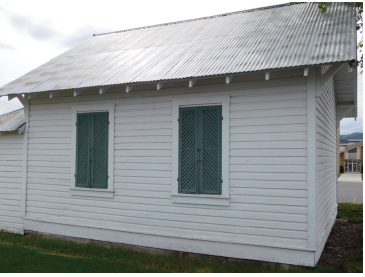 The Society successfully raised the funds and did much of the work themselves to create the “Thayne Ward Relief Society” building. In the 1950s, the LDS Church built a new and modern church, and the Relief Society moved to the new location. However, the building did not stay vacant. Until the 1950s, the Daughters of the Utah Pioneers (DUP) had been meeting at member’s homes each month. When the Relief Society moved the land and building were signed over to the DUP group, giving them a consistent location for their meetings and allowing them to continue their community work. The DUP changed the name of the building to the Silver Star Camp. Today the building still houses the still houses the DUP Silver Star Camp of the Lincoln County Company, an organization dedicated to honoring the names and achievements of the men, women, and children who founded Utah. They provide a broad scope of services, ranging from the preservation of historic landmarks to the education of thousands of school children and adults about their pioneer forebears. “As we continue to make improvements, we always preserve the original integrity of our building,” says Linda Holsan, 2nd Vice Captain in the Silver Star Camp. This project was funded in part by a Historic Architecture Assistance Fund and completed by Dubbe-Moulder Architects in Jackson. The program is offered by the Alliance for Historic Wyoming in partnership with Wyoming Main Street and the Wyoming State Historic Preservation Office and is made possible by a grant from the Wyoming Cultural Trust Fund.